A federally funded nonprofit in Nebraska is being accused of unfairly targeting indoor tanning salons, according to a lawsuit filed in the state. Seven small businesses have filed suit against the Nebraska Cancer Coalition (NC2), claiming the nonprofit group is engaging in a "propaganda" campaign of false, misleading, and defamatory statements to try to put them out of business. NC2 is supported by the Centers for Disease Control and Prevention (CDC), and was created by funds from the federal agency for a "comprehensive cancer control program." Now the group is targeting tanning salons, claiming indoor tanning is more deadly than smoking cigarettes. "The Bed is Dead campaign focuses on educating Nebraska girls ages 18 and under, and their parents, on the dangers of indoor tanning," according to the campaign’s website. 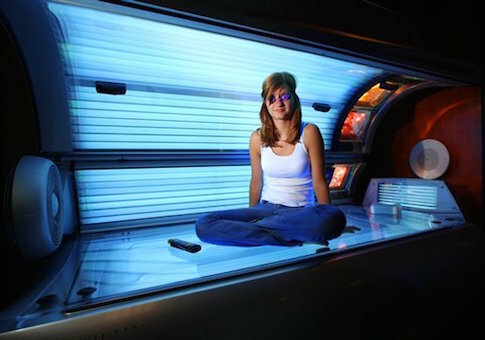 "Community organizations, student groups and the Nebraska Cancer Coalition are working together to spread the message with the goal of changing the behavior of young women who tan indoors." So far, "The Bed is Dead" has gotten 219 people to sign a pledge to not tan indoors. Last month seven business owners who run 30 tanning salons filed a lawsuit in state court against NC2, claiming the campaign is making false statements about their livelihood. "Small businesses in Nebraska are suffering, and consumers are being misled, as a result of the misinformation being put out by [NC2]," said Bart Bonn, president of plaintiff Ashley Lynn's, Inc., the Palm Beach Tan franchisee in Nebraska. "We advocate moderate and sensible UV exposure for Nebraska citizens who choose to tan, and pride ourselves in operating our businesses within both FDA guidelines and the law." "It is both unfair and unlawful for [NC2] to attack our businesses with a campaign full of deception and untruths," he said. Among the statements the tanning salons are calling "qualitatively misleading" is NC2’s claim that "indoor tanning causes more cancers than cigarettes every year." "In the United States, tobacco use is responsible for nearly 1 in 5 deaths; this equals about 480,000 early deaths each year," according to the lawsuit. "That number is approximately 37 times greater than the total number of skin cancer deaths in the United States annually (12,980)—the overwhelming majority of which occur in men over age 50 who never used a sunbed." The lawsuit also claims that NC2 was a corporate sponsor of Omaha’s Fashion Week in March, "where its agents emblazoned with ‘the bed is dead’ T-shirts handed out its propaganda, and bought ad space in the Omaha Fashion Magazine." The small business owners operate almost 70 percent of tanning salons in the Omaha and Lincoln, Nebraska, areas. If successful, the campaign would undercut Obamacare, which imposed a 10 percent excise tax on indoor tanning to pay for part of the law’s programs. The tax is bringing in much less revenue than the law predicted. NC2 was created after the Centers for Disease Control and Prevention (CDC) gave federal funds to the Nebraska Department of Health and Human Services to create a cancer plan in the early 2000s. The coalition became a non-profit in 2010. "The Nebraska Department of Health and Human Services (DHHS) began receiving funds from the Centers for Disease Control (CDC) to develop a comprehensive cancer control program," according to the Coalition’s state plan. "The partnership evolved in August 2002 with the first partner meeting. By January 2004, the partnership had grown to nearly 130 persons representing 100 groups and organizations across Nebraska." "In 2010, the Nebraska Cancer partners filed paperwork to become incorporated as a 501(c)(3) non-profit entity," the document continued. "At the same time, the partnership name was changed from Nebraska C.A.R.E.S to Nebraska Cancer Coalition (NC2)." The stated reason for the change to a 501(c)(3) was to "apply for grants not available to state government programs" and "increased ability for advocacy." NC2’s "The Bed is Dead" campaign is funded by the CDC. "This campaign is supported by the Cooperative Agreement Number 5U58DP003928-02 from The Centers for Disease Control and Prevention," according to its website. "Its contents are solely the responsibility of the creators and do not necessarily represent the official views of the Centers of Disease Control and Prevention." NC2 collaborates with other programs within the DHHS, including the Nutrition and Activity for Health Program, which receives an annual budget of $727,000 from the CDC, according to the state plan. The Nutrition and Activity for Health Program also received stimulus funding totaling $320,000 in 2010. It is unclear how much funds "The Bed is Dead" campaign receives from the CDC. Request for comment from the NC2 and the CDC were not returned by press time. Though the anti-indoor tanning campaign’s website acknowledges support from the CDC, NC2 did not list any government grants or funding on its 990 in 2013, which reported revenue of only $56,812. Update 2:27 P.M.: A spokesperson for the CDC confirmed that the coalition received $41,227 in funding this fiscal year. The spokesperson also said the agency does not comment on pending lawsuits. The funding for the coalition is for activities in addition to skin cancer," said spokeswoman Brittany Behm. "In other words, the $41,227 is not just for their work about skin cancer."